I fell in love with the characters. Valka was bold, brave, daring and stubborn. She loved flying though she had only flown in the local flight club with old and worn down planes. She dreamed about fighting in the war, and she idolized the legendary female pilot Marina Raskova. Her best friend Pasha was shy and kind. He liked to build and fix machines, like his radio. He would rather stay home than to fight in the war. However, he had no choice but to enlist in the army, or he would be denounced as a traitor. When Pasha was recruited to fight in the war, Valka was sad to see him go and envious that she couldn’t do the same… Until one day, when she learned that Raskova was recruiting young female pilots for her air regiments. Over the course of the next four years, Valka and Pasha were separated in the war effort but they exchanged letters, sharing with each other their guilt and fear and also the mundane details of daily life. What had begun as friendship grew into something more. I loved this subtle and very slow-burning romance. I loved seeing Valka and Pasha’s growth in this book as they were introduced to the art of the battle. Though Valka had once been excited to fight, she later learned its complexities as she saw both her friends and her enemies perish. And though Pasha had been gentle and kind, the war wore him down and left him scarred, both physically and mentally. I enjoyed reading about the secondary characters, including Iskra, Valka’s other best friend, who was the calm voice of reason. I loved reading about the other girls in the regiment. There were close friendships and interpersonal differences, but there was a sense of camaraderie in this tight-knit group. My one complaint was that there were many minor characters, such as commanders and other girls in the regiment who were introduced simultaneously and difficult to keep track of. The plot evolved slowly, letting us get a glimpse of the major events surrounding the 588th regiment. However once I got past the 2/3rd point, I couldn’t put the book down. Among the Red Stars was thoroughly researched, down to the details of how a night bomber regiment operated and the uniforms of the female pilots. I knew nothing about the Night Witches (the 588th Night Bomber Regiment) before reading this book but I could imagine vividly the day in the life of the pilots and the conditions that they lived in. The story was told through Valka’s voice, though we also catch glimpses of Pasha’s point of view through the letters that he wrote. Although I enjoyed the writing for the most part, I found that the letters exchanged between Valka and Pasha were more detailed than a letter usually would be. Also, some of the dialogues exchanged between characters seem forced. 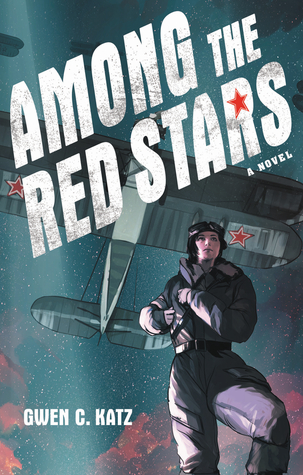 Among the Red Stars is a brilliant historical fiction with strong female characters and great character chemistry. It is well-researched and got me flipping the pages. Do you read historical fiction? If so, what is your favourite historical fiction read? It seems so interesting! I read lots of nonfiction history but I also enjoy well written historical fiction. And since this seems to be the case here I am adding it to my (ever growing) wishlist. There are a lot of great historical fiction books, I would say Band of Brothers is very well known, maybe Ian McEwan’s Redemption is better in the sense it’s not all war. Stephen Lawhead’s Byzantium is epic and fun to read. Claude Mossé’s Crime in the Agora is also nice. This isn’t an exhaustive list of course but if anyone needs more detailed info, I will be happy to oblige. Thank you Sophie for another great book recommendation! I’m a new blogger and was wondering if you could perhaps help me and give me a few tips which would help me be better at blogging and gain more followers. I would be extremely grateful if you could help me out.